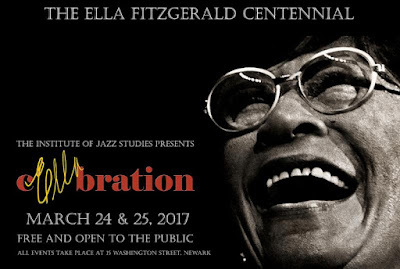 A free two day celebration of ELLA FITZGERALD will be held at 15 Washington Street, Newark, March 24th-25th. The event brings together musicians, historians, authors, record producers, critics, and fans, and will feature performances by vocalists Alexis Morrast and Carrie Jackson. From the world of jazz studies are distinguished archivist Dan Morgenstern, and Norman Granz's biographer Tad Hershorn, who has had a major hand in shaping the event. Eminent journalist and critic Will Friedwald will be showcasing rare footage, and musical demonstration will be provided by Mike Wofford and Richard Wyands, both of whom worked with Ella Fitzgerald. LINK: Full program and link for registration. BBC Radio 2 Celebration of Ella Fitzgerald featuring BBC Concert Orchestra, starring Clare Teal, April 11th.